David Reyes plunges his hand into a black smelly liquid at the bottom of a cut-off plastic jug tied around a palm tree and pulls out a dead horned beetle. “We used to put insecticide on the bottom of these traps,” says Reyes, the agricultural manager of Hondupalma – a cooperative of small landowners in Honduras that produces palm oil. “Now we simply use alcohol with sugar cane molasses to kill off the bugs.” According to Reyes, these new measures saved the co-op $175,000 in pesticide costs over the past two years. Hondupalma recently achieved a Rainforest Alliance certification for sustainable growth of African palms – the first cooperative in the world to feature the famous green frog seal on the cooking oil they sell. Palm oil (generically labeled as vegetable oil) is used in almost all consumer products on the market: from ice cream and ramen noodle soup to toothpaste and candles. Expanding oil palm plantations are among the top reasons for deforestation globally, along with cattle ranching, timber, and soy. The improvements achieved by the cooperative extend beyond reduced chemical use. José Alfredo Torres, a local sustainability auditor who helped them earn certification, recalls that workers in the plantations often used to die from snakebites. Deadly pit vipers (locally known as “yellow beards”) would hide in the tall grass around palm trees and bite the harvesters’ legs as they looked upward, cutting palm fruits with sickles mounted on a 50-foot poles. As part of the effort to achieve certification, the plantation owners have started a training program for the workers that teaches them to clear the grass around each tree before they start harvesting. They also provide more protective clothing. Benigno Hernandez and Odair Canales from Hondupalma cooperative looking out for a troop of monkeys in a former palm oil plantation, now set aside to regrow as a secondary forest. “This forest keeps our stream running, ” says Canales when asked why they stopped growing palms there. Photo by Tanya Dimitrova. Another improvement Torres highlights is that children no longer work on the plantations. Until just a few years ago, youngsters would follow their mothers out to the fields to collect fallen palm fruits for extra cash. Now, they attend a local school that is largely funded by cooperative money. “They really take care of the community,” says Torres. This people-friendly approach appears in sharp contrast with alleged human rights violations by another palm oil company just a few hours up the road. Dinant Corporation recently received much bad publicity after the World Bank’s own ethics compliance advisor criticized the bank for lending $15 million to it. According to the ethics report, the company allegedly evicted and harassed farmers in the region, allegations the Bank failed to investigate prior to disbursing the loan. In addition to social improvements, Hondupalma cooperative recently built a wastewater plant to treat water residue from the palm oil processing factory. The foul water, filled with decomposing fruit leftovers, not only is cleaned before being discharged into the river, but also is used produce electricity for the factory–turning costly waste into a useful product. The energy production technology is simple: fill a cistern with wastewater, remove all the air, and let the microbes feed on the organic waste. In the process, the microbes release methane, which is captured in giant rubber balloons the size of covered football fields and fuels a small power generator. Over the past two years, the cooperative has invested $2.5 million in these improvements, or about five percent of its annual profit. “Palm oil is very profitable,” says Torres. A ton of it sells for close to $1,000 on the international market and the cooperative produces around 60,000 tons per year. 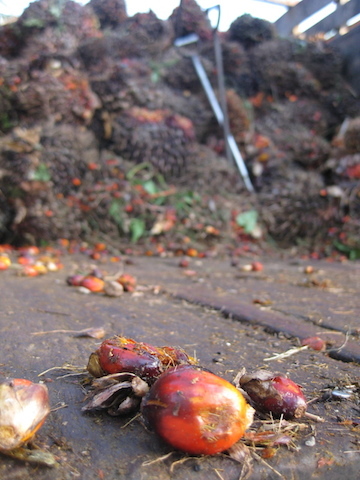 Oil palm fruits ready to be processed. Photo by Tanya Dimitrova. Hondupalma’s 600 members founded the cooperative 30 years ago. They jointly own around 25,000 acres of plantations in Yoro region, an area roughly equivalent to 15,000 football fields. Although this may sound substantial, the company is responsible for less than 10 percent of all palm oil produced in Honduras. Moreover, the Central American country is a small player in palm oil production globally, as almost 90 percent of all oil comes from Indonesia and Malaysia. “There is a lot of room for improvement in this business,” says Stephen Krecik, a palm oil expert with Rainforest Alliance. The American NGO has partnered up with local agricultural experts to develop a standard for sustainable palm oil plantations as an alternative to the certificate developed by the Roundtable on Sustainable Palm Oil (RSPO). 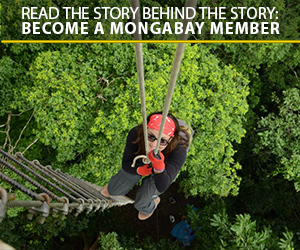 As part of its improved practices, Hondupalma cooperative has pledged to zero deforestation as they expand and has even set aside some previously planted areas to return to the wild. “Zero deforestation” is actually beyond the requirements for Rainforest Alliance certification. A farm can feature the green frog seal on their products as long as the original land clearing took place before 1999 and it does not plan to destroy any new “high value ecosystems” (a catch-all term for forests). In case it does, however, it has the option to offset the action by protecting a patch of forest somewhere else. “The rules are probably unnecessarily complicated,” says Chris Wille, chief of agriculture at Rainforest Alliance. Nonetheless, the certification body hopes that its sustainability requirements are more stringent than those developed by RSPO. It remains to be seen, however, whether or not “zero deforestation” will be achieved by certified farms. David Reyes, Hondupalma agricultural manager, explains how horned beetle traps work. Photo by Tanya Dimitrova. Giant rubber balloons holding methane gas extracted at a waste water treatment facility. The gas fuels a small power generator producing electricity for the palm oil processing plant. Photo by Tanya Dimitrova. The reporting trip to Honduras was partially funded by the Rainforest Alliance. (04/09/2014) After years of criticism from environmental groups, Cargill says it will establish policies to eliminate deforestation, peatlands conversion, and social conflict from its palm oil supply chain. But activists aren’t yet sure what to make of the agribusiness giant’s pledge. 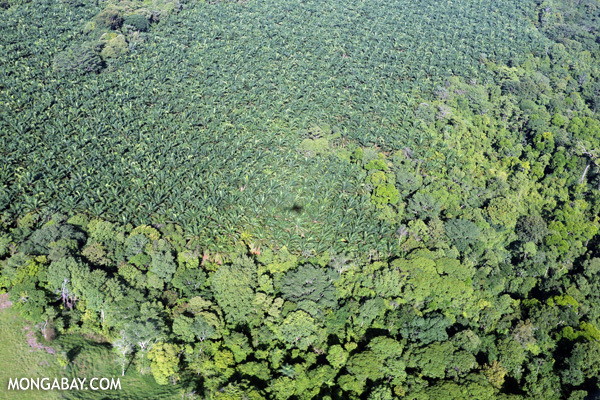 On Tuesday Cargill released a letter it sent to the Roundtable on Sustainable Palm Oil (RSPO), a body that sets eco-certification standards, in response to a Greenpeace Report linking it to deforestation. (04/08/2014) Procter & Gamble (P&G) and Cargill today announced new measures to cut deforestation from their palm oil supply chains. P&G (NYSE:PG), a consumer products giant that owns brands like Head & Shoulders and Oil of Olay, pledged to establish traceability of palm oil to supplier mills by the end of 2015. The policy commits it to eliminate deforestation from its supply chain by 2020. (04/08/2014) Although Showtime’s landmark new climate change series doesn’t premiere until Sunday, the network has released an edited version of the first episode of Years of Living Dangerously to the public (see below). The nine-part documentary series is being billed as a “groundbreaking” exploration into the many ways that climate change is already wreaking havoc on the lives of people around the world. (04/03/2014) Unlike other palm oil giants that have recently made strong commitments to eliminating deforestation and social conflict from their supply chains, Malaysia-based Kuala Lumpur Kepong (KLK) continues to source palm oil associated with forest destruction and community conflict, argues a new report published by the Rainforest Action Network (RAN). (03/25/2014) Safeway has become the latest company to establish a policy that excludes deforestation-linked palm oil from its products. (03/24/2014) Two consumer products giants have joined the wave of companies committing to deforestation-free palm oil. On Monday General Mills and Colgate-Palmolive both announced palm oil policies that go beyond standards set by the Roundtable on Sustainable Palm Oil (RSPO), the industry’s main certification body. The policies include provisions to protect wildlife-rich rainforests and carbon-dense peatlands, while respecting the rights of local communities.